The Leader in Me is a whole-school program, developed in partnership with educators, that empowers our students with the leadership and life skills they need to succeed in school and beyond. It’s based on principles and practices of personal, interpersonal and organizational effectiveness, and upon the powerful premise that every child possesses unique strengths and has the ability to be a leader. By developing well-rounded children who know their strengths, we help them unleash their potential to lead their own lives and to influence others. A crucial part of this process is that it be schoolwide—everywhere, all the time (ubiquitous). Our teachers and staff make leadership development a part of the everyday student experience, including teaching leadership principles in meaningful ways, creating a culture of shared leadership, and helping students take more ownership for their academic learning and goal achievement. Students learn how to become self-reliant, take initiative, plan ahead, set and track goals, do their homework, prioritize their time, manage their emotions, be considerate of others, express their viewpoints persuasively, resolve conflicts, find creative solutions, value differences, and live a balanced life. 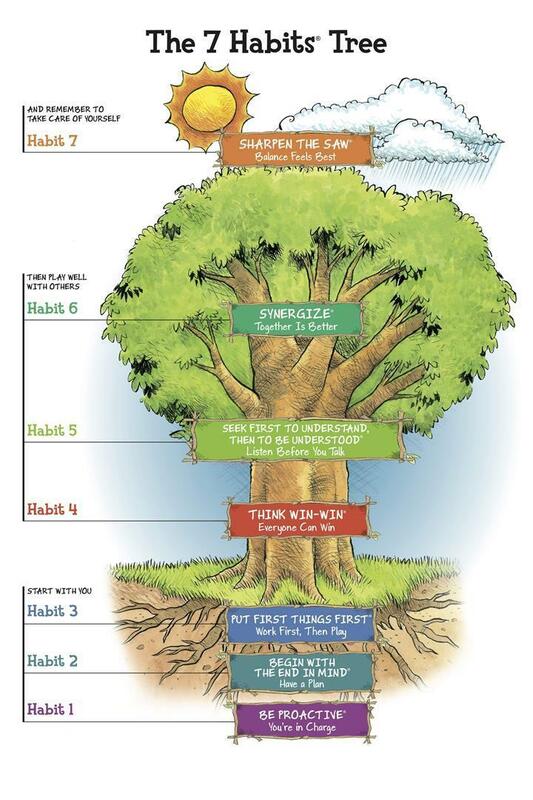 "The 7 Habits of Highly Effective People" is one of the key frameworks of The Leader in Me program, helping our students learn and apply leadership skills while developing a common language that is essential in building a strong leadership culture. As our students understand and use the 7 Habits, they become more motivated, organized, engaged, and take ownership of their learning. Our students craft class mission statements, apply for class leadership roles, set personal and class goals, write classroom codes of conduct, and learn about accountability, respect and responsibility. Our schools are passionate about creating a unique school environment—murals, signs, paintings, quotations, posters—that bring school culture to life by providing a visual representation of their goals and aspirations. The art within our schools reverberates a message to each and every student: “You are important, you have gifts, and you have potential. Using the terms found in "The 7 Habits of Highly Effective People," phrases such as Think Win-Win, Carry your own weather, Seek first to understand, and Wildly Important Goals are not only common, but well understood and internalized by our students, teachers and staff. This language is used in discussions throughout the day and across the campus. Parents have an important role in helping their children develop a deeper understanding of the leadership principles taught in The Leader in Me program, and there are many opportunities for parents to participate in their child's leadership journey. Parents are encouraged to practice The Leader in Me principles at home and to attend programs, meetings and trainings offered by our schools throughout the year.